Bicycle Registration Checks on the Rise? 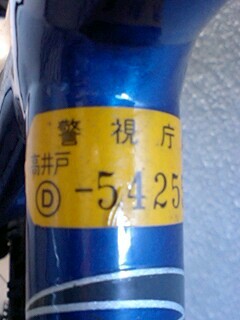 Is there a crackdown on bicycle registration checks going on in Tokyo at the moment? On my morning commute through Setagaya-ku yesterday I noticed the police carrying out registration checks in three different locations and this morning two more. I've been cycling in and around Tokyo since 1996. I commute to work almost every day. I cycle almost every weekend. I ride the family Mamachari to the supermarket in the evenings, ferry my daughters around by bicycle on the weekends. Despite the number of hours I spend on a bicycle each week I have not once been stopped for a registration check. I frequently ride 4 different bicycles and I must be on a different one each time I pass a policeman and I'm still never questioned. I have read so many complaints from overseas residents of Japan that the police use bicycle registration checks as an excuse to pull over foreigners to check their alien registration cards and visa details. I must not fit their target profile as I've never been stopped for a registration check nor hassled by the police at Narita. The only time I've really been spoken to by the police in relation to my cycling habits is during the road safety campaigns the hold a few times each year at which time the come down hard on everyone for a few days they go back into hibernation. Oh, and when I've broken some usually unenforced cycling law. Have you ever been stopped for a bicycle registration check and do you think there was a deeper motive in getting you pulled over? When I had an old bike! I've never been stopped or a new or old bicycle, or ones that were obviously not meant for my size. But had Dutch friend who got stopped once a week. I'm an american in tokyo and I've never been stopped or given any trouble, but the other day an american friend of mine was told he couldn't park his bike next to the station. There were already some 30 bicycles parked there, and we park in that same spot every day. We asked him why, and couldn't he see the bikes already there? He grumbled and said he'd let my friend off just for once. Rather odd. Generally tho, officers are helpful and reasonable, not getting upset over harmless infractions. I've been stopped many times, few years ago. Recently not much. I used to be stopped by night when I was riding a cheap mamachari but now I ride a fixed bike and nobody stops me just to check my ID. I believe it depends where you ride the bike (being foreigner, riding by night with no lights can help to be stopped) and which kind of bike you ride. Around Ikebukuro or popular areas it's very easy to be stopped. In Aoyama never happened to me. Same for parking: you can park everywhere in Aoyama but it's very difficult to find a place in Ikebukuro because it seems all the spots are no-parking and if you park in the morning 100% your bike won't be there in the evening. A few months ago I was stopped by police in Ikebukuro because I didn't have a rear break (for fixed bikes is perfectly common and legal all over the world except Japan, I didn't know it). I was stopped and asked many question, treated like a serial killer and I was told I did something very bad and serious. I had to go to trial a month later. In the court I explained my reasons and I didn't have to pay the fee (up to 50,000 Yen) but I was forced to place the break again.